Raymond Anthony “Ray” Borg is a mixed martial artist born August 4th 1993 in Albuquerque, New Mexico. He competes in the Flyweight division in the UFC. At time of writing he is ranked #4 according to the UFC rankings. Ray Borg made his amateur MMA debut in 2011. He had a total of four fights and won all of them by rear-naked choke in the first round. His pro MMA debut came in 2012 and his first pro opponent was Gene Perez at King of the Cage – Ignite. Borg defeated Perez by submission and of course it was a rear-naked choke. His next foe, Peter Baltimore also fell victim to the rear-naked choke. Before he signed with the UFC he won six professional fights, four of them by rear-naked choke. Ray Borg made his UFC debut on April 19th 2014 at the event UFC on FOX: Werdum vs. Browne. After a tough fight Borg lost a split decision. He went on a tear winning three straight fights, two of them by stoppage. 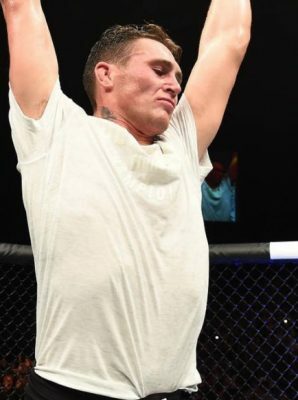 Shane Howell and Chris Kelades was defeated by stoppage and Geane Herrera went the distance with Ray Borg. Next he faced skilled Karate fighter Justin Scoggins, Scoggins’ movement was too much for Borg and he lost a unanimous decision. Ray Borg rebounded with two straight wins against top ranked competition in Jussier Formiga and Louis Smolka whom he both beat by decision. Ray Borg was supposed to face off against Flyweight Champion Demetrious “Mighty Mouse” Johnson on UFC 215: Johnson vs. Borg 9th of September in Edmonton, Alberta, Canada. Borg fell ill during the weight cut and had to withdraw from the contest. This marks the third time that Borg has missed weight or pulled out of the fight the week of the fight.